We’ll meet near the Snail’s Pace store at 6:00 p.m. We gather in front of the In Flower floral shop (1050 E. Imperial Hwy in Brea), which is located between Snail’s Pace and Tempo Urban Grill. Congratulations to Corrin, Miranda, and Natasha for completing the 2017 Los Angeles Marathon. Corrin and Natasha trained together for the past twelve weeks and ran the entire course from Dodgers Stadium to Santa Monica side by side. Natasha and Corrin just before the start of the 2017 Los Angeles Marathon. Natasha and Corrin with their medals – Still smiling! This was Marathon number 16 for Miranda. 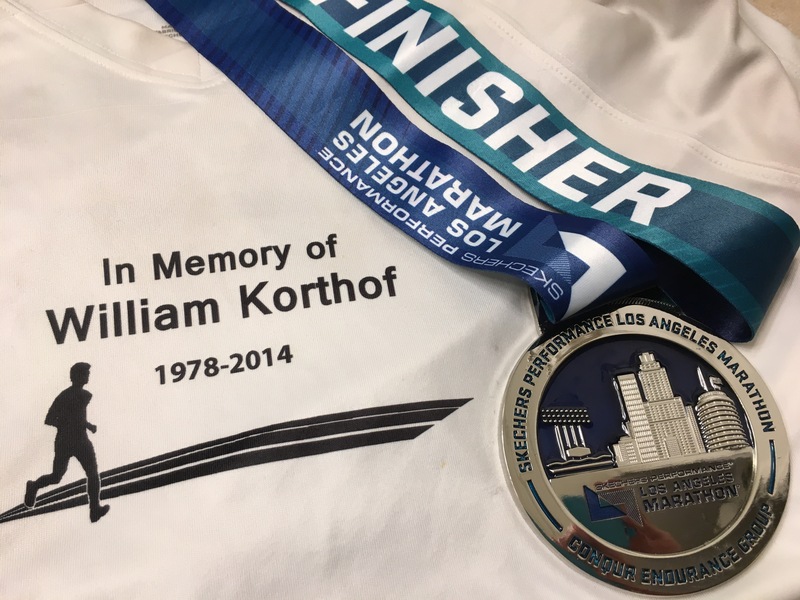 She ran it in memory of her friend William Korthof. Congratulations Ladies! You are a great inspiration to all of us. Congratulations to both of you! I’m in awe of your success!! !